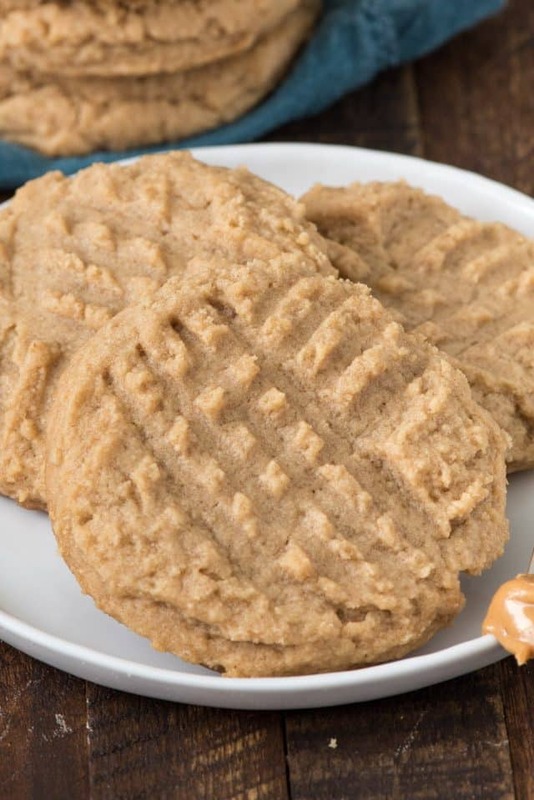 This is the BEST Peanut Butter Cookie Recipe you’ll ever make. It’s soft and chewy and full of peanut butter flavor. It’s a classic – and it’s my husband’s favorite cookie! Can we talk for a minute about kids getting older? Man, it’s hard. When you have an infant or a toddler or even a little and you see older ladies at the store and they’re all “enjoy this time it goes by so fast!” all you want to do is roll your eyes and be all, yeah mmm-hmmm just give me that older kid please so I can sleep through the night! Jordan is now 13, going into 8th grade. If I’m being honest, I’d take 13 over toddler any day, but man getting used to this new-and-teenaged kid is just HARD. They, like, have opinions now. And don’t want to do things they used to do. It’s hard to get used to. The next 5 years are going to be…interesting, that’s for sure. In the meantime, I have an old standby recipe that doesn’t change – ever. It’s as true as time! Really – it is. It’s actually on this blog in several other forms: stuffed cookies, cookie cake, cookie pie, gooey bars. 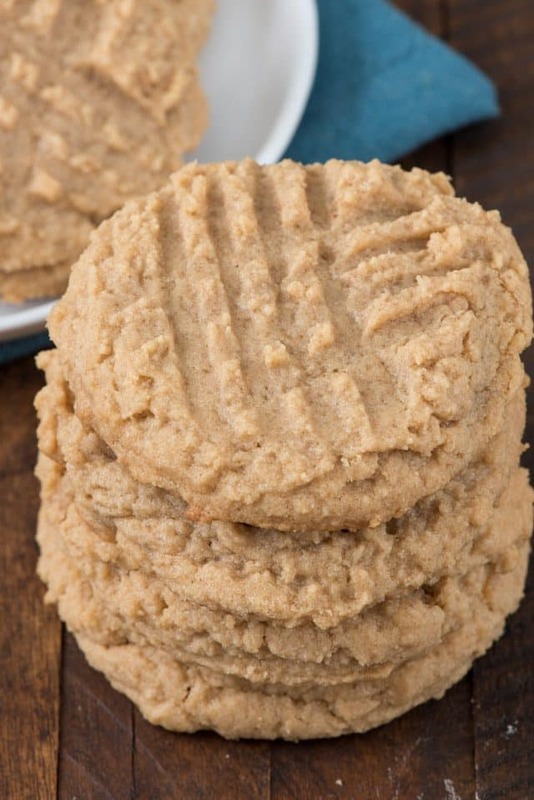 I figured it was about time I posted the basic good old fashioned peanut butter cookie recipe. At least this recipe won’t change like my kid. HA! And so many more ideas! 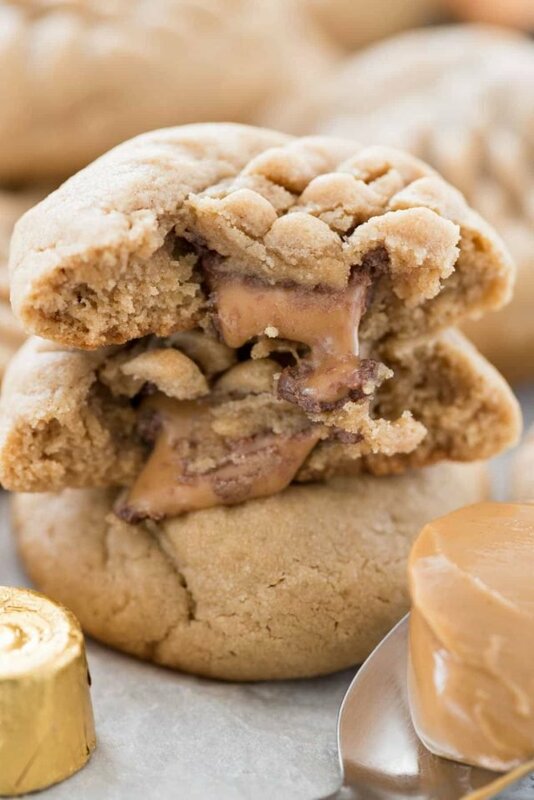 This easy peanut butter cookie recipe is classic and easy and the best base for any other peanut butter cookie creation. Let’s break down the components in the best peanut butter cookies. Unsalted Butter. Sometimes you see that peanut butter cookie recipes call for shortening. While you can easily substitute shortening for the butter, I prefer the flavor that the butter lends to the cookie. It makes it a bit more light and fluffy too. Peanut Butter. It’s the most important part! For this recipe, use a regular no-stir peanut butter you can get at the regular grocery store. Forego natural peanut butter unless you’re using a no-stir natural (like Jif or Skippy). Use crunchy for some extra texture! Brown sugar. This cookie recipe is FULL of brown sugar. I love using brown sugar in cookies so much more than granulated. While this recipe has both kinds of sugar, the brown sugar keeps the cookies soft. The rest of the ingredients are normal for a peanut butter cookie: baking soda, salt, flour, egg, milk. Like I said, this is a basic peanut butter cookie recipe. But it’s anything BUT basic. It’s the best ever peanut butter cookie recipe! Have you ever wondered why there are hash marks (or criss cross marks) in peanut butter cookies? It’s because adding peanut butter makes them not spread as much, so the fork criss cross was to help the cookies flatten and bake evenly. Another good thing about peanut butter cookies? They don’t need to be chilled! Since they don’t flatten much (because, science), you don’t have to wait to have the best peanut butter cookies ever. This recipe is my favorite peanut butter cookie recipe. I hope it will be yours too! 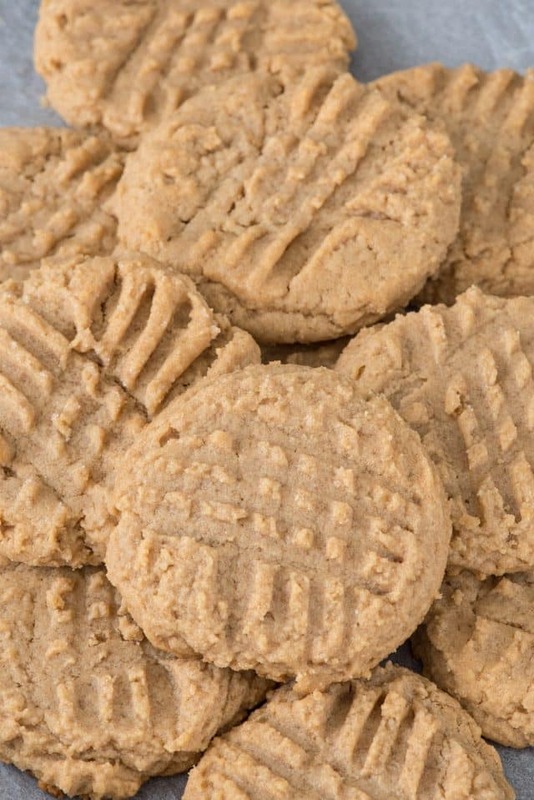 This is the BEST Peanut Butter Cookie Recipe you'll ever make. It's soft and chewy and full of peanut butter flavor. It's a classic - and it's my husband's favorite cookie! Preheat oven to 350°F. Line two cookie sheets with silicone baking mats or parchment paper. Place butter and peanut butter in a large bowl. Using a hand or a stand mixer, mix until combined then add both sugars. Cream until smooth. Mix in egg, vanilla, and milk and mix on medium speed until combined. Bake for 9-13 minutes, or until the edges are just golden brown and the tops are no longer glossy. Cool on cookie sheets at least 10 minutes before removing. Be sure to check out all my peanut butter cookie recipes! Rolo Stuffed Peanut Butter Cookies are gooey! 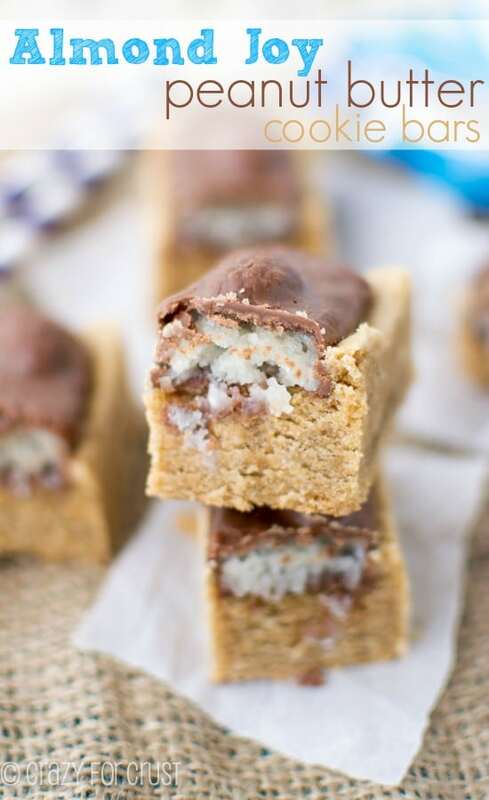 Make Peanut Butter Cookie Bars with Almond Joy! I love these peanut butter cookies with pretzels! These look yummy! I think I will make then in a 9 x 13 pan but add milk chocolate chips too. Cant wait until I can make them. Thank you Dorothy! These are wonderful as is but I like Lisa’s comment about adding milk chocolate chips! YUM! This is an excellent cookie recipe. If you w to send them over the top in a very easy way add 1 cup of Planters Honey Roasted Peanuts to them gives them extra crunch and that extra salt punch. Thanks for the recipe! these really are the BEST!!!!!!!!!!!!!!!!!!!!!!!!!!!!!!!!!!!!!!!!!!!!!!!!!! These are really good. Lots of peanut butter flavor. I accidentally used low-fat peanut butter, but the still tasted really good. I like a crispy/crunchy cookie. Maybe next time I’ll bake them a little longer. Hi Dorothy, thank you so much for adding the weight in grams for your recipes! I’m from The Netherlands and it makes it so much easier for me to make these yummie American recipes. I love your website! These peanut butter cookies are baking in the oven right now. They look delicious and I can’t wait to try them! I’ve been looking for a great peanut butter cookie recipe for FOREVER. This one is being made this weekend – it looks so good! This is the best peanut butter cookie recipe I have made. I have baked many peanut butter cookies but this is the ultimate recipe. Thanks for sharing your recipe. 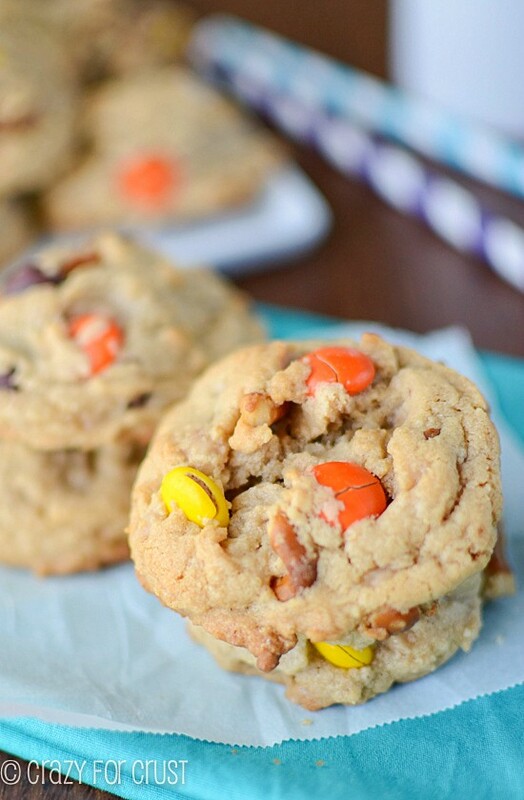 Do you think adding a Cup of Reese’s Peanut Butter chips to this recipe would work out okay? Thanks for the great Recipes. Basic cookie recipe looks good. Right ratios. But my primary compliment is that you put the ingredients in grams. 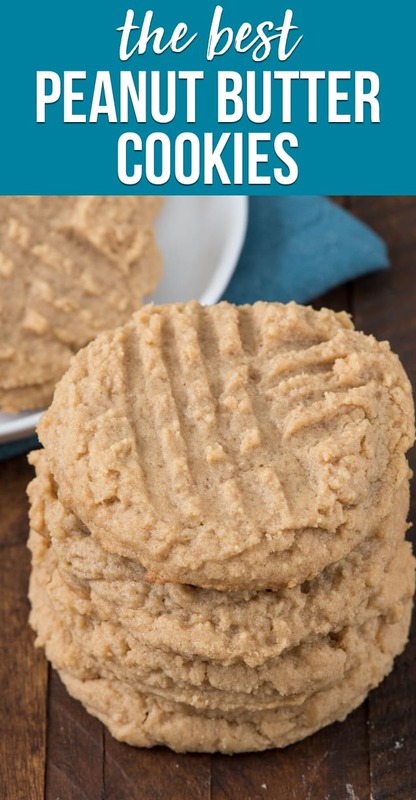 I’ve made a lot of peanut butter cookies over the years (they’re my husband’s favorite) and I think this is my favorite recipe. I’d never added milk to cookie dough before, so I was a little skeptical, but the overall cookie is light, fluffy and tasty. Didn’t have enough flour…I’ll see how they turn out! Fingers crossed!